Drones, which were once a reserve of the military, are now utilized for precision agriculture. The number of farmers adopting the use of drones in farming is growing steadily because extreme weather conditions are on the rise. Owing to these circumstances, many more farmers are expected to embrace drone technology. With the growing world population, agricultural consumption is expected to grow tremendously. But, did you know there are some disadvantages of utilizing drones in agriculture? Yeah, It is like any other technology, drones have their pros and cons that farmers ought to be aware of before they go buying one. Using Unmanned Aerial Vehicles (UAVs) has spurred quite the controversy. Many in agriculture support it, saying it could take precision agriculture to the next level, while some are a little more cautious, fearing what it could mean for the big data battle. In this article, we explore the harmful effects of agricultural drones you don't suspect, because of the pros of agricultural drones we have provided. Drones are opening up the skies to farmers who want better ways to monitor their crops. Although flying a drone over a field is less labor-intensive than walking through one, use of drone in precision agriculture still take too much time and effort for farmers to use. There are some issues of using drones in agriculture. Most of the agricultural drones have a short flight time, between 20 minutes to an hour. This may not be effective in monitoring very large acreage. The flight range also limits the radius that can be cover during every flight time. Drones that are designed to monitor in longer flight time and longer range are relatively more expensive. Drones with the good design and features that qualify them for use in the agricultural are quite expensive. This is mostly so for adjust wing drones which could cost up to $25000 (PrecisionHawk’s Lancaster). For some agricultural drones, the heavy cost is inclusive of hardware, software, data programming, tools and imaging sensors. Buying agricultural drone that does not come equipped with the necessary equipment could be cheaper. However, the desired cameras, hardware, and the processing software are quite costly making it equally capital intensive. Buying drones equipped for use in agriculture could prove costly in the short run but worthwhile in the long term. The use of agricultural drones is considered commercial. This means the farmer needs to undergo Federal Aviation Administration (FAA) operator training so as to acquire a remote pilot certificate or hire an operator with such qualifications. FAA also demands that drones be flown at an altitude of not more than 400 feet. The legality surrounding this complex system is still in question. One legal expert says as it stands today, using a drone in commercial agriculture is illegal. The legislation around drone flights or Unmanned Aerial Surveys (UAS) over forest areas and indigenous lands can be unclear. Conditions for the use of drones need to be agreed between, for example, community of members, NGO, public bodies like Members of the Legislative Assembly (the NT parliament) and external facilitators. As agricultural drone use becomes more common continously, regulations are increasingly necessary. As governments develop drone legislation, they face the challenge of providing legal clarity and addressing potential conflicts of interest (for example, communities may wish to use agricultural drones to monitor areas used by extractive industries or agribusiness, such as palm oil plantations). Controversies over drone use could require intervention by public agencies. In fact, legal or not, drones are already in high demand. Agricultural drones share the same airspace with manually manned aircraft. Hence they are prone to interference. It’s, therefore, advisable the farmer files his/her flight plan with the local airport or the FAA before the flight. Most of the arable for growing crops in the US have very little online coverage if any. 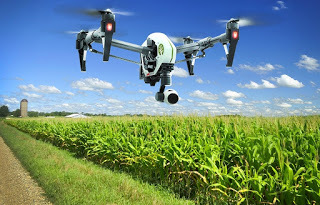 This means that any farmer intending to use agricultural drones has to invest in connectivity or buy a drone capable of capturing and storing data locally in a format that can later be processed. Drones are much more dependent to climatic conditions, unlike traditional aircraft. If it is extreme weather outside or rainy outside you may not be able to fly them because of some risks. The image capture and processing requires analysis by a skilled and knowledgeable personnel to translate to any useful information for farmers. Drone technology is unlikely to be familiar to common people, while data processing and geospatial analysis will need support from a partner organisation. This means an average farmer without these skills may need training in drone maintenance, piloting and programming or may be forced to hire a skilled personnel conversant with the analysis software to help out with the image processing. Drones are still too manual and complicated for farmers to use on a regular basis. The drone technology is time-consuming, particularly for large commercial farms that have thousands of acres and sites that are miles apart. Using an off-the-shelf drone requires the farmer to drive to each field and hand-launch the drone. 0 Response to "The Disadvantages of Agricultural Drones"